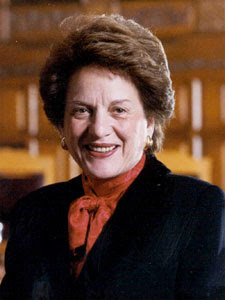 Judith Kaye, the first woman named to New York State’s highest court, the Court of Appeals, and the first to serve as its Chief Judge, died today at age 77. The section of U.S. District Judge Jack Weinstein’s decision summarizing this testimony remains one of the most popular pages on NCCPR’s website. After Weinstein ruled, the City appealed. At one point the federal appellate court sought clarification of New York law from the state Court of Appeals. That led to a sweeping, unanimous decision, written by Judge Kaye, making clear that New York State law does not allow this barbaric practice. In effect, that extended the impact of the lawsuit statewide (though, as always, it’s not clear if child protective services agencies actually are following the law). Of course, the fact that a child wants a particular outcome doesn’t mean he or she should get it. And some children are too young to express a rational preference, or any preference at all. But deciding what’s best is what judges are for. And they can’t truly do justice unless everyone has an advocate making the best possible case for his or her side. The New York State Bar Association promulgated guidelines calling for children’s lawyers to follow the direction of their clients – the children - except where the child was too young. But the guidelines were not binding. Judge Kaye made them binding. One of the reasons juvenile courts can get away with trampling on the rights of families, and attorneys can provide representation that’s inadequate – or worse – is that, in much of the country, the hearings are secret. Slowly that’s been changing, and today, nearly half of America’s foster children live in states where these hearings are open to the public and/or the press. In New York, that was done by order of Judge Kaye. I believe the news stories exposing what went on those courts after the hearings first were opened are part of the reason New York City became a national leader in providing high quality defense counsel for families caught up in the child welfare system through organizations like The Bronx Defenders, Brooklyn Family Defense Practice and the Center for Family Representation. Her own family has many reasons to be proud of the legacy of Judge Judith Kaye. And a lot of children and parents who may never have heard of her have reason to be grateful.